sMelanoma, cancer stinks! : Recent occurrences of pain have me in the hospital. 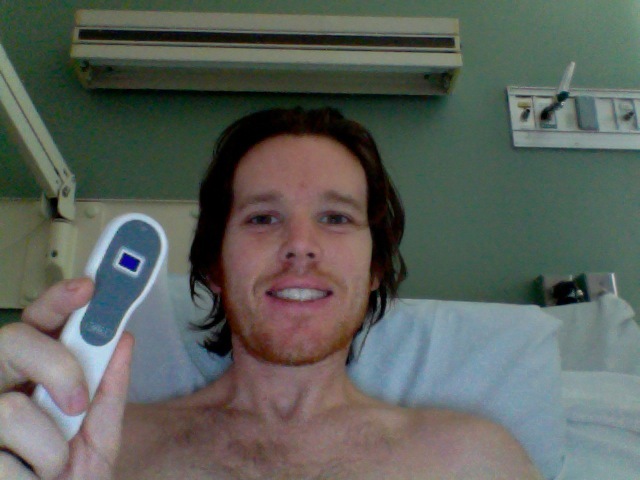 Recent occurrences of pain have me in the hospital. After experiencing a few recent incidents of absolute crippling pain in my right side and a couple trips to the emergency room, I decided it was time to update everyone as best I could. Though the pain is now under control, our best guess is that the tumor is finally pressing up against something and potentially causing some inflammation. This series of events all started after receiving Zometa treatment on the 14th of January. I was supposed to get a slight fever and have a day or two of flu like bone stiffness. Instead what I got was a fever that lasted until Monday at times each over 104.3. I was seen by the doctors on Tuesday where they drew a couple bacteria cultures, regular blood work and we as a flu culture. Nothing yet has come back abnormal, which means that it could have been an unfortunate consequence of flu bug that was just gone by time it was tested for. The next Friday on the 21st while sitting at the office. I started having some strong pains in my stomach. I went home and by the evening I found a couple positions that I could lay i that would help reduce the pain. I was able to sleep but woke up at about 2 AM with that same pain coming back on strong. I fought the pain until the morning, but then decided it was time to visit the ER. After some blood work, CT scan and a couple pieces of chocolate the Dr diagnosed me with possible pleurisy (inflammation around the lung tissue) or muscle spasms in my chest wall. He mentioned that even if he were totally wrong and the pain was somehow tumor related, the treatment would pretty much be the same. So he prescribed me valium and recommended 600mg Ibuprofen every 6 hours to keep down inflammation. He sent me home and I was doing pretty well taking it pretty easy. Back to work on Monday and things started changing agains pretty rapidly. Though I already had a follow up at my oncologists's office for the next day, they wanted me to come in right away to see what was going on. They wanted me on a stronger pain medication but were pretty adamant about not covering any signs on additional fever so they sent me home with a bottle of Oxycodone. I took one immediately and another soon after when the pain didn't seem to go away. The pain got bad enough so I asked Amy to drive me home. We didn't make it out of the parking garage before we decided I just need to get get to the ER. I was bent over in agonizing pain, I just litterally could not breathe. We called our research nurse who told me to take another 2 oxy and get to the ER. We called Steven down from the office and he drove us to the closest hospital where they immediately doped me up on morphine. Needless to sy, at that point ... I wasn't feeling much of anything. I've since been transferred to INOVA Fairfax Hospital. This is where my oncologist, Dr Spira and his associates have hospital practicing privileges. It has been a lot of wait and see. I'm on some steroids to treat the inflammation now. Ive been having a tough time keeping anything down (I blame all the dope) but they have me scheduled for an MRI. Seems like that will happen sometime this morning. Af of last night, I've been able to keep down some food and some drink, so I'm heading in the right direction. They moved we away from the constant pain medicine drip. I'm now on a much less aggressive pain patch with access to a patient controller pain med button should I need it. All things considered after living with Melanoma for more than two years, this has been my first real complication. Let's just hope that the Ipilimumab will pick up the pace and rid my body of this disease. Mike ~ I'm sorry to hear you are dealing with so much discomfort. Your a fighter! Fingers and toes crossed that the Ipilimumab will pick up the pace and rid you of this cancer. All the strongest wishes, prayers and healing energies your way. Mike, My husband is melanoma stage iv. I've been reading your blog / journey for awhile now and am hoping for a mircle for you... My husband and I are a bit older with 20 and 15 year old daughters. He has been stable with liver mets (after IL2 2 years ago). I just wanted to say I'm in awe of you and your wife. I've read your blog and it has helped me believe in those dark moments that a cure is possible -- though I knew the special diet you were following would not be happening here LOL. I marvel at you and your wife's strength and dedication. Hold her close. This is a lonely road for her (I know) -- No matter how many friends and family. No one can easily reconcile that they may be losing the love of their life. I want to see you win this fight as I want to see my husband win! Mike Brockey....what the heck???? You take care of YOU..and Amy, you take care of Mike. Then when things get boring again (meaning no pain and no running to the ER and hospital), then it's Amy's turn to be pampered. I love you, Brockey Family! Will be watching for updates. But in the meantime, thanks for posting the pic...because you look pretty darned healthy! Please read this and start taking this tea asap. The book is not available cheaply, but read the reviews, specifivally the one by Mr. Feldt. It won't hurt to do this. So sorry to hear about this segment in your voyage!You are an amazing inspiration to all who have the pleasure of crossing your path!I will continue to hold you and your family in my heart. Mike, I am waiting to be diagnosed yet and have read a lot about the Gerson therapy. It sounds very good, would you not consider going back to their hospital when you feel a bit better? I hope you get better soon. Big hug for you and your wife..